Fulbright scholar and recipient of many an accolade and the Founder Director of the acclaimed Mudhralaya, Dr. Lakshmi Ramaswamy, who has a natural instinct to walk on the not-so-oft-trodden path, was recently in Kolkata with her senior disciples Jagyaseni Chatterjee and Dhivya Srilakshmi to enlighten the knowledge hungry connoisseurs of dance and music with items danced to Sangam literature and poetry. She was hosted by the Indian Museum to commemorate the International Museum Day observed annually all around the world on the 18th of May. 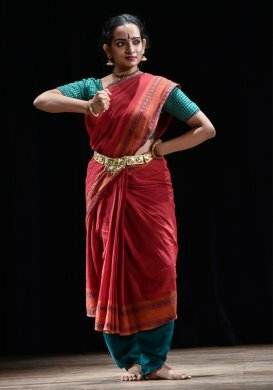 The theme for this year was “How to connect people through the arts.” Lakshmi Ramaswamy’s work on Sangam Age literature amply fitted their bill. This was the first time light was thrown upon such a profound topic. What was amazing was the kind of secular thoughts written during ancient times seemed to be so topical. In her search on Sangam Age of Tamil history of the Cheras, Cholas and Pandyas she came across Purananuru, the poetic work in Ettuthogai Noolgal, the secular anthology of Sangam literature, among her other findings. Her solo performance which was a connoisseur’s delight, referred to Pottiyaar, the poet who went happily to meet his dear friend, King Kopperunchozhan. When he did not spot him in his palace, he was directed to the graveyard, where he spotted the headstone of his dear friend, the king. 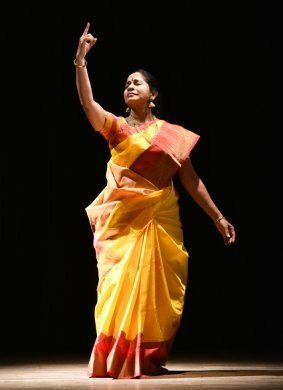 The audience watched intently the shocked question mark on the dancer’s face, “Where are the hands that tirelessly gave gifts to singers and dancers?” Her vivid vocabulary of dance brought out the meaning of the simile that compared the king to a tree that gave cool shelter to all his subjects. Has all his greatness come to nothing? The poet lamented in myriads of ways. A poignant piece dealt by a mature dancer gave the audience a lump in their throats. The sympathetic king had told his friend, when he had offered to accompany him to the action field, “This is not the right time for you to come along with me. Your wife is pregnant and it is the right time for you to be with her. When I come back after winning the war, you bring your wife and child, let us meet then!” “But finally I only got to meet this headstone,” says the grief struck poet. This kind of impulsive realism is something unique which is usually not found in classical literature. Lakshmi was brilliant in giving a brief history of Tamizagam and the assembly of scholars and poets in the three sangams of the vast Sangam Age literature, which has been lost perhaps because a tsunami submerged a huge piece of land known as Kumari Kandam in these parts. Madurai - not the present Madurai -Kapatapuram and the present Madurai are pin-pointed as the places where the three sangams took place of which historians have some knowledge. For the evening’s performance, Lakshmi Ramaswamy had chosen a song authored by Kapilar signifying union. Here the heroine goes through sweet reminiscences about her lord. The poetry richly describes her lord with similes and metaphors. Her reciprocated love in equal measure by her lord is compared to the honey bee perched up in her hive on a tall sandalwood tree with the sweet nectar from the lotus. The dance interpretation was adequate and delectable. Jagyaseni Chatterjee elaborated through aesthetic abhinaya the importance of her lord to her very existence just as water is to the earth. Lyric 49 authored by Ulochanar was a song, where the sakhi was tensed up, because of the unrestrained gossip about her friend’s romantic relationship with the hero. Her lamentation was also for the fact that her mother was keeping her under house arrest. The topic of the song is as relevant today as it was at the time it was penned. The sakhi’s only suggestion to escape the heat created was to elope with the hero who would be coming to meet her in her garden in his horse drawn carriage. Her practical desire was to see her friend living a life of bliss. Dhivya Srilakshmi’s anguish as the friend in need was authentically expressed. Dhivya’s ability in the pure dance portions was no less enjoyable. Lakshmi Ramaswamy chose poems from Nattrinai, an anthology of nearly 400 poems by various poets. Separation of lovers depicted in a song by Theipuri Pazankayittrinaar seemed to be the problem of today’s lovers separated for earning money and pulled in a tug of war, with his heart urging him to go back to the woman with long tresses whose eyes were like the blue lotus and his head telling him to carry out his mission of building up his wealth. The dance depicted the lover’s state which is like a worn out thread pulled by elephants from both ends. Tapati Chowdurie learnt dance for almost 10 years from Guru Gopinath in his dance institution Natana Niketan in Madras. For a brief period, she was with International Centre for Kathakali in New Delhi. Tapati has a Master's degree in English Literature and Bachelor's degree in Education. Presently, she is a freelance writer on the performing arts.